If there’s one thing I hate more than atheists advertising on buses (actually I don’t hate that – “probably no God” – where’s the commitment…) – it’s so called “Christians” doing nutty things to give the rest of us a bad name. 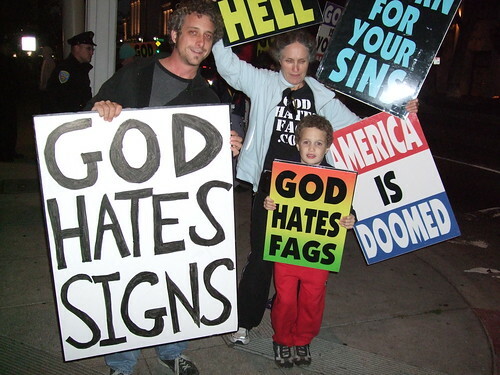 The Westboro Baptist church systematically protests at the funerals of dead US soldiers becaues they believe the US system’s lax stance on homosexuality. I don’t think they read the bits in the bible where Jesus hangs out with sinners, prostitutes and tax collectors… anyway, kudos to this guy for his funny sign campaign. If you can’t beat them – join them. I once went to a branding seminar where VirginBlue marketing guru Sean Cummins said the best way to position your brand is to ask “what sort of car am I” and then see where and how that type of car is being advertised. Cheap market research. Well, Landor and Associates, an American market research company, has just released their “Candidates as brands” survey. As far as cars go – Obama is a BMW, while Biden, Palin and McCain are all Fords. In the personal computing stakes – arguably currently the most interesting advertising feud at present – McCain, Palin and Biden all come in as PCs – Obama scored a dead heat and is both a PC and a Mac. Toilet humour is not something this blog dabbles in. I don’t think I’ve used the word “poo” except to describe cat poo coffee on a few occasions. But this story from Coogee about the poo in the icecream has really piqued my interest. I was at the Coogee Bay Hotel just days after the alleged incident occured completely oblivious – luckily when in Coogee I choose to purchase my gelato from gelatissimo. If I was in Coogee I’d be steering clear of iced magic topped ice cream for the forseeable future. “You made my mum eat poo!” – Mrs Whyte’s children screamed at a staff member in the pub. “There’s nothing to indicate that staff working on the day were responsible, it was frozen, so it could have happened at any time,” the lawyer for the Whyte family. “We just don’t know who’s handled it, how it’s been handled over the three weeks, whether it’s been abused in some way,” Food Authority spokesman Alan Valvasori said. What this does go to show – once and for all – is that not all publicity is good publicity. This is probably the beginning of the end for the Coogee Bay Hotel – or at least its staff. * A quick google on news results for “coogee bay” makes it seem like a pretty unappealing holiday destination. It’ll be a while before the pub can repair its reputation with the punters – let alone make light of the situation – but my guess is that ice cream with chocolate topping will be off the menu for some time. Q – What’s brown and sticky? Really, that’s not very funny at all – and it’s not something I’m proud of. I am eagerly anticipating the outcome of this story though – it’s proved pretty popular on news sites around the country so I don’t think we’ve heard the last of it. * I don’t really think that – it just ties in with the heading nicely and makes it make sense. The YouTube comments are divided (and contain strong language). But still, with a 3.5m croc terrorising Magnetic Island – this could be our new tourism ad. With the Fonz in his corner who can stand against him. 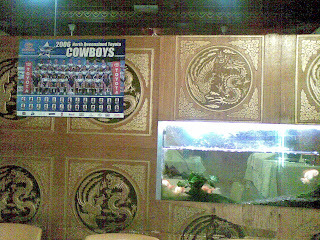 The local chinese takeaway has a rather incongruous cowboys poster to match mao dynasty decor and the obese goldfish. This is pretty cool. 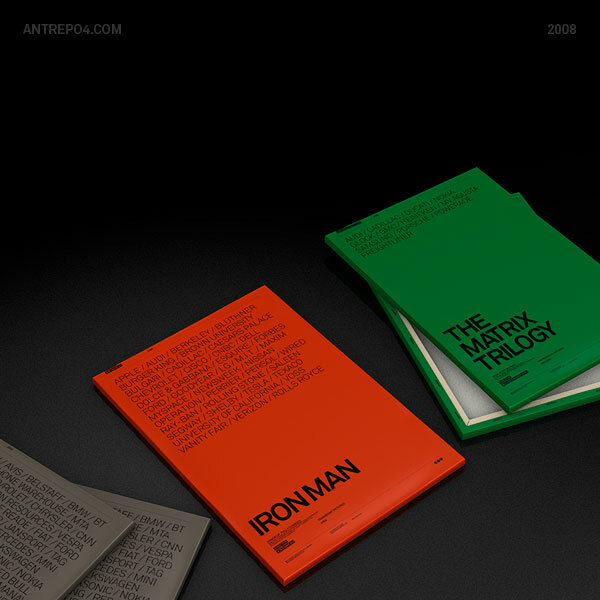 A graphic design company has released a series of movie posters featuring the products “placed” in those movies as stars. http://pdfundo.net/convert/ – this might be worth keeping in mind if you ever have to unPDF a document. One of the girls at work just used it and it worked. Now to find a PDF to convert. Following my post earlier today regarding the product placement posters – here are some interesting snippets from this SMH story today. It seems paying for product placement is no guarantee you’ll make the final cut – particularly in the new James Bond movie. Sony Ericsson saw a 20 % rise in sales after Casino Royale was released. TODAY IS INTERNATIONAL CAPS LOCK DAY* IN THE US (THE 22ND OF OCTOBER). I DON’T KNOW WHY ALL CAPS HAS SUCH A BAD NAME. OTHER NETIQUETTE RULES MAKE SENSE – AND ARE DESIGNED FOR A REASON. THIS ONE JUST SEEMS TO BE TO REDUCE FREEDOM OF EXPRESSION. I DO NOT FEEL LIKE I AM SHOUTING – BUT CONVENTION SAYS THAT TO POST IN THIS MANNER IS TO SHOUT RUDELY. I SAY CONVENTION IS RIDICULOUS. WHAT SAY YOU? I would like to know where this rule comes from – but I can’t seem to find anything. Other than it just became broadly accepted because someone said so. Please. Enlighten me. Part of the celebration of International Caps Lock Day is designing useful hacks to get your caps lock key to do something other than capitalise your writing**. I’m not sure what I’d get it to do. Also, I think it odd that the Caps Lock key is not written in all caps. I also wonder why the keyboard is presented with capital letters when you have to hit shift to make the letters capitals by default. Also – when it comes to capitals – we are minimalists according to our corporate style guide as mentioned previously. I still think you’re better off indicating that you’re shouting by using shouty words – ALL CAPS is just hard to read. * That link contains swearing and generally bad English. ** This one probably has swearing but the English is ok.
I’m in Sydney at the moment at a conference for users of our work’s Content Management System. It’s not what I expected it to be. I was thinking there’d be lots of young nerdy guys drooling over code and wearing pocket protectors. I was wrong. It’s actually mostly pretty old people – and a fairly even gender split. Sometime during the last two years I became our office’s official geek – I don’t know how it happened. But a lot of the stuff the people at this conference are getting excited about is beyond me. I sat at a dinner table with the guy who is pretty much everyone’s hero for some work he did with AJAX (the coding/script thing that pretty much powers Facebook) and the Content Management Platform – he presented earlier today. People kept coming up to him wanting to buy his work. He told me he’ll probably put it up for free, silly him. Dave Hughes MC’d the conference dinner. He was very funny. He apparently gets paid over $10k to do that sort of gig. Clearly I’m in the wrong career. One of my favourite things about this conference has been the number of terrible tech glitches in presentations. Powerpoint appears to be the bane of even the technologically elite – although most of the presenters have been using Macs – and it’s beautiful presentation software. I decided the other day that I’d like a Mac. Especially one of the new ones with the funky touchpad. If my choice of luxury materialism comes down to a toss up between a Mac, a coffee grinder, an XBox 360 or a new TV – I’ll be in a real bind. At the moment I am probably leaning towards this option . Robyn remains unconvinced. It’s still cheaper than a piano though. On Tuesday night I lugged Sheila (my tank of a coffee machine) to a lady’s Wine and Cheese night event that our church held. I made quite a few coffees using some El Salvadorian beans I roasted on Monday. I’ve been meaning to write a little bit about coffee on this blog – and probably will later. Right now there’s a bit of a fight going on on the street outside my hotel – I haven’t adjusted to daylight savings time very well so it still feels quite early to me but most people appear to be asleep. I’m staying in a hotel called “The Dive Hotel” in Coogee. It’s very nice. A fairly large room in what appears to be a converted terrace house right on the beach in what I think is Sydney’s nicest suburb. Breakfast is a communal affair – and the in room brochure/manual thing warns guests (particularly children) not to pat the hotel’s aging dog – one of those little furry balls that only just passes as a dog – because in its old age it no longer tolerates children. Pretty funny stuff which adds to the homely appeal of the place. Who would take a hurricane called Norbert seriously?